It is almost here. Finally. The Orioles will open the season on the road in Tampa on Friday and I for one can not wait any longer. This is of course the time of year when we all start to lok ahead with stars in our eyes and hope in the cockles of our hearts. ESPN has weighed in and, as expected, has predicted the Orioles to be an also-ran once again. As usual the Yankees and Red Sox are picked to be the class of the division. You really can't argue with them or be that. Until the Orioles play at a level that resembles "competitive" in some way they will be an afterthought. They will not open the season on ESPN unless they are playing sacrificial lamb to the Red Sox or Yankees. Young pitching prospects will be overlooked while the national media does backflips trying to convince itself that Sergio Mitre and Ivan Nova and a late signing of Kevin Millwood is enough to fill out a legitimate rotation. Until Nick Markakis gets his gold glove, Adam Jones hits that 20th homer and Matt Wieters starts hitting like one of the lesser apostles, as opposed to switch-hitting Jesus, we will be forgotten. Maybe that is why Buck Showalter's comments last week made me so happy. At least someone in a leadership position on the team is talking the talk, as it were. At least we don't have to act like the forgotten cousin of the AL East even if it works out like that again. But, could this be "the year"? Perhaps, I hope so anyway, but I still have some concerns. The exhibition season for the Orioles ended today as they lost to the Blue Jays, 7-4 in Sarasota this afternoon. Derrek Lee, who started Spring Training on the injured list , went 3-for-4 with two doubles and an RBI. Lee says he’s healthy and ready to go. Matt Wieters had two hits and drove in run as well. Chris George, who started the game, gave up three runs on five hits in two innings of work. The bullpen – Koji Uehara, Mike Gonzalez, Kevin Gregg and Jason Berken – held their own until the latter portion of the game when Josh Rupe and Pat Egan each gave up two runs in an inning of work. Both teams seemed to have trotted out their everyday lineups as a final-tune up to the regular season. From here on out, the games count for the Orioles as they kick-off the season against the Tampa Bay Rays on Friday night. Then again, it must be a shock for the players heading north realizing that they may have to play in some chilly weather for the next month or so after being in Florida since late February. Good to see baseball finally back up north here soon! The Orioles are finishing up their final week of exhibition baseball on a strong note. They played a split squad schedule, as they played two games – one against the Red Sox in Sarasota, the other against the Blue Jays on the road. Against Boston, they got a 4-3 win thanks to a three-run, eighth inning as Matt Wieters had a two-run single, followed up by a Ryan Adams RBI-single. Nick Markakis drove in a run in the third inning with a single. Chris Tillman continued his bid for a starting spot in the rotation as he had an up-and-down outing, going 5 2/3 innings and allowing three runs. He walked four and allowed six hits against a Red Sox team with most of their regular starters. Opening Day starter for the Orioles, Jeremy Guthrie had a tough day on the mound against the Blue Jays on the road. Toronto would win the game 9-5 as Guthrie allowed twelve hits in five innings and gave up four runs. Pat Egan, who came into the game to relieve Guthrie took the loss as he gave up three runs in an inning of work. Felix Pie had a 2-for-4 day and drove in a run. Robert Andino also had two hits; meanwhile, Nick Green homered and drove in two. The Jays teed off on Oriole pitching as Rajai David was perfect at the plate, going 5-for-5; Aaron Hill has three hits and Yunel Escobar homered – a two-run shot – plus drove in five. Well, the silly Buck Showalter comments continue to reverberate with the teams north of Baltimore on the I-95 corridor. Of course, we’re talking about the Yankees and Red Sox. Before I go all into a mini-game recap from Saturday, I wanted to speak more about Adam Jones. As we all know, Adam Jones has a profile article up on the Baltimore Sun website and has a series of video interviews. One has gotten the attention of many. I alluded to this yesterday: I was a little shocked hearing what Adam had to say about fans and visiting rival fans – mainly, from Red Sox Nation and the Evil Empire (New York Yankees) – taking over Camden Yards at times. I’ve been in the ballpark more times than I want to remember when those fans have come to Baltimore. Most have been decent people, only coming to watch a ballgame and support their team; however, some are boorish, foolish and don’t pay the respect to those in a visiting ballpark. We, as fans have talked about it amongst ourselves, on blogs, message forums, sports talk radio and wherever else. Now, we’ve got a player who doesn’t like it any more than we do. Good. We finally have a player -- Adam Jones -- who outwardly shows that he cares . He may have come off a little strong on his interview, but he came off a bit frustrated with his situation. You know what, I appreciate Adam let what’s on his mind come out. We found out some of his most inner most thoughts about fandom and the sport – perhaps too honest – but, he didn’t put on an act or give us a speech with little substance. Furthermore, on the heels of Buck Showalter’s now infamous comments – that people up on Boston and New York are dumbfounded by – we have a player who believes his team and can, plus finally wants to get out of the cellar. He didn’t hold anything back, and good for him. We want our athletes open and free to express themselves; therefore, we may have gotten more than we wanted out of Adam Jones. 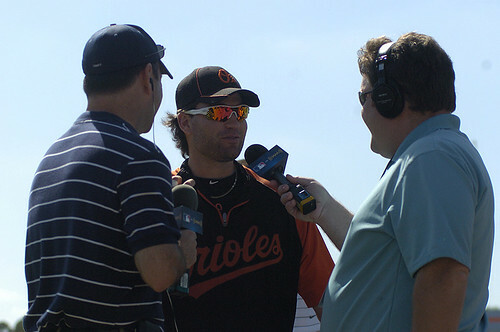 With the Orioles just one week away from the start of the 2011 campaign there are still some lingering questions. Reimold/ Pie is still floating around; I frankly don't see how Jake Fox doesn't make this team right now but the biggest questions surround the rotation. We have all heard about players being "quietly" good, well I hate to say it but the young starters have taken a turn and they have been "quietly" bad as of late in ST. Matusz got shelled in his last outing; Arrieta was wildly inconsistent; Duchscherer will start the year on the DL and Bergesen was drilled on his pitching arm and had to leave one of his last starts early. Guthrie has looked alright in his three starts but he has only pitched nine innings this spring so it is a bit hard to grade him so far. Tillman has looked solid in his 12.2 innings this spring but the stand-out player is Britton. The Orioles top prospect has surrendered only one run in his 14 innings of work this spring. But Britton is not likely to make the team out of ST due to contract stuff and a desire to give him a bit more seasoning in AAA. So the rotation is not looking as confident as it did in the beginning. Manager Buck Showalter has set the rotation, kinda. Guthrie will get the opener in Tampa followed by Brian Matusz after that the only sure thing is Jake Arrieta will get the home opener in Baltimore against the Detroit Tigers. The "number 3" and "number 5" starters are still in question and it seems to be an open competition between Bergesen, Tillman, Britton and Duchscherer. Showalter is not in any hurry to set that fifth starter slot as one will not be needed until later in April. So who will get that third spot? It most certainly will not be Duchscherer although he is still in the hunt for the fifth spot if he can get healthy so that leaves Tillman, Britton and Bergesen. I thought going into this spring that Bergesen's role was all but locked in but his inconsistent play has potentially knocked him out of the rotation and back to the minors, which would have to be disastrous for the young pitcher. So we come back to the Tillman/ Britton discussion. Tillman has been alright this spring pitching to a 3.50 ERA striking out seven and walking five in his innings but he still seems to be haunted by inconsistent control issues that held him back last year. Britton has been a shining star for the pitchers this year, but there are no indications that the plans for Britton have changed as a result of his spring performance. This afternoon, the Orioles lost 6-5 to the Minnesota Twins; however, the biggest news of the day happened real early in the game as pitcher Brad Bergesen got drilled with a line during the 4th pitch of the game (and didn’t make it past the first batter, Denard Span). Considering how shaky Bergesen has been throughout March, today’s start was very important to him – and the team. Right now, the only thing that the tests and X-Rays found were a contusion, but it could have been much, much worse. Who knows if he will be ready for Spring Training, or if things turn out to be serious; however, the Orioles may have dodged a bullet. The Twins did all their damage in the second inning in which they plated six runs. Reliever Mike Ballard – who came in for Bergesen – got crushed thanks to a two-run homer by Delmon Young, and runs driven in by Mike Cuddyer, Matt Tolbert and Tsuyoshi Nishioka. Justin Morneau had an RBI sacrifice-fly. Although the Orioles got a two-run homer from Adam Jones, and longballs – solo – by Jake Fox (his freaking ninth of the Spring) and Nolan Remiold, it was too little, too late for the Orioles. Last night down in Sarasota, the Orioles defeated the Pittsburgh Pirates, 11-7 in exhibition action. For the most part, the offense carried the team as Felix Pie homered and drove in four; as well, Mark Reynolds hit his first homer of the spring. 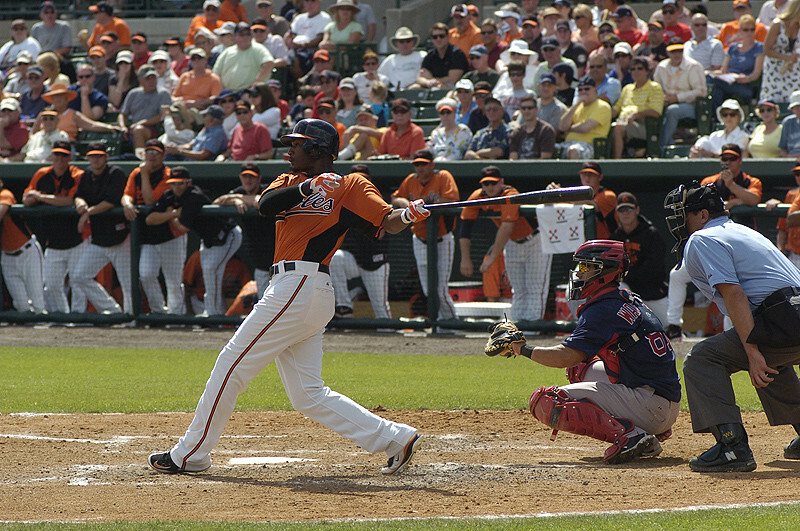 J.J. Hardy and Vladmir Guerrero each drove in two runs as well. On the mound, Jake Arrieta had an up and down night. He gave up four runs in five innings, gave up three homers and walked three; however, he did strike out four and did his job well after a shaky first inning. Overall, his performance was so-so and he’ll need to be far more consistent in his outings in order to help the Orioles improve. With a week until the Orioles play their first game of the regular season, manager Buck Showalter named Jeremy Guthrie the Opening Day starter. Also, the Orioles made some cuts yesterday to their squad with the most notable name on the list Josh Bell being sent down to Triple-A. He came into camp in shape, lost weight and looked improved. He’ll back sooner rather than later – I hope – but let’s see if he can be more consistent at the plate. I’d love to see Zach Britton come with the team for Opening Day; however, it’s looking more and more likely that he’ll be kept in the minors to take advantage of his arbitration clock. Yesterday, the Orioles lost 5-2 to the Twins on the road in Grapefruit League action. The Orioles got solo home runs from Vladmir Guerrero and Adam Jones; however, the Brian Matusz struggled on the night as he lasted only 1 1/3 innings, gave up four runs on five hits. It was not a good night for the Orioles, but they got to see a look at a part of their future as Manny Machado – the first round pick of the 2010 First Year Player Draft for the Orioles – came into the game in the eighth inning to play shortstop and got an at-bat. I watched a bit of his appearance and he looked smooth in the field. Machado looked like he belonged out there and made quite an impressive play – that didn’t realty in an out – to almost nail a runner. Hopefully, we’ll get to see more of him as he climbs the minor league ranks en route to the majors. Finally, the big news from Florida for the Orioles on Wednesday came off the field, rather than on it. Right now, arguably the most popular member of the Orioles, Buck Showalter let his feelings be known about his rivals in the American League East – mainly, the Boston Red Sox and New York Yankees. The Orioles this afternoon earned a 6-2 win over the New Yankees as Zach Britton threw five plus innings of one-run ball, Luke Scott showed some life at the plate – finally – with a two-run homer, and the hottest Oriole on the planet, Jake Fox, hit his eighth longball of the exhibition season. Although Britton faced a Yankees B-lineup with Mark Teixeira and Nick Swisher in the lineup, he struck out five and allowed six hits. The Baltimore bullpen kept the Yankees at bay for the rest of the game and got Britton his second win. With nine days remaining before the Orioles kick off the season in the Tampa Bay area against the Rays, one has to wonder if Britton has a role on the major league squad. I’m sure it’s being talked about all over. As a fan, I hope he makes it and is on the roster on Opening Day. Britton has shown that he can do the job based on his numbers in Florida and perhaps has been the best hurler on the team. However, the business of baseball may work against him in this case. The Orioles yesterday were able to squeak out a win against the Tampa Bay Rays, 9-8. Pitcher Brad Bergesen did a lot better yesterday than he has recently, going five innings and giving up two runs; however, reliever Ryan Drese got shelled as he gave up six runs in less than two innings of work. Nick Green helped the Orioles get the win with a two-run double in the bottom of the seventh and reliever Mike Ballard got the save. Luke Scott broke out of a slump as he got two hits on the day; meanwhile, Nick Markakis drove in three runs and Adam Jones drove in one. The big news from yesterday is that Brian Roberts returned to the lineup, and he finished the game healthy this time. He went 0-2; however, from all reports he seemed to be moving fine and without injury. As I’ve said again and again, the Orioles will need him healthy in order to improve on their record from last season. Yesterday, the Orioles lost to the Phillies on Saturday, 7-5; however, the big news of the day was that first baseman Derrek Lee finally saw some action in a Spring Training game. The big man walked and struck out in his appearance at the late, and he looked fine on the field. Sadly, he left the game early due to a sore foot – thanks to a foul ball that hit it – however, he told the media that he was happy with the results and felt good. He’s not played much at all, and who knows if Lee will be ready by Spring Training – as the season begins next Friday doen in Tampa Bay. As of for the pitching, Jake Arrieta struggled once again as he gave up four runs in 4 1/3 innings. Clay Rapada would come in relief of Arrieta in the fifth inning and give up a three-run shot to Shane Victorino. The pitching suffered again late in the game as reliever Mike Gonzalez gave up a solo homer to Erik Kratz in the seventh inning that decided the game. The Orioles got another nice performance from Vladmir Guerrero, who went 3-for-3 with two RBI’s. This spring, Jake Fox has been kicking arse at the plate and taking names. He’s hit an astounding seven homers – with two more on Thursday -- during the spring and was a major reason for the Baltimore’s win over Pittsburgh, 13-3. One would think right now that Fox should be included on the roster coming up north to Baltimore. I would tend to agree; however, what position would he play? First? Outfield? Catcher? Designated Hitter? Right now, it’s a backup catcher spot. He’s fighting with Craig Tatum – who performed competently last year -- for a job. I don’t know if we are seeing the real Jake Fox – not likely – or just a guy having an amazing Spring Training and getting timely hits off pitchers that will more than likely start their season in the minors. Whatever is happening, let’s hope he has enough bullets for the regular season. Let’s hope it’s just more than a hitter just simply having a good month. Dinged up starters Brian Roberts, Derrek Lee and Koji Uehara could appear in games this weekend. All have progressed well and seem to be back on track this spring healthwise. According to Roch Kubatko Roberts hit off a tee from both sides while Lee took soft-toss. Both felt good. Manager Buck Showalter feels they are both on track for April 1 so long as there are no other setbacks. The Orioles were featured on MLB Network's 30 in 30 show tonight. The hour-long program featured analysis of the team from Sarasota - and that is really about all I can say. Anyone that was looking for in-depth hard-hitting analysis would need to go elsewhere. The overall tone: They are improved but the AL East is HARRRRRRRRRRRRRD. Thanks guys, tell us something we don't know. That being said the show seemed to be very positive Former Oriole Harold Reynolds seemed particulary excited with the Orioles new (projected) lineup for Opening Day and when comparing it to last year's lineup it is hard not to see the significant improvement. Replace Tejada with Vlad (in the cleanup spot); Atkins with Lee; Pie with Reynolds (in the seven-hole) and Izturis with Hardy. Definite improvement right there, it really can't be argued. But it isn't exactly the thought professional analysis that I think some wwere looking for. But then again the IS the MLB network, they really aren't going to expose the warts of their own product very much. They aren't exactly going to roll into Seattle, Baltimore, Cleveland and KC and say: "sorry guys you may be better but pack it up; no chance," so the fact that the questions to Mark Reynolds were a bit soft and the coverage was a bit fluffy should not be that much of a shock to anyone. Yesterday, the Orioles got a nice, well-deserved win in exhibition action against the Pirates as they won 8-2. Pitcher Jake Arrieta went four innings, allowed two runs, struck out six – however, he allowed eight hits, but no walks. I fathom at this point that he’s got a pitching spot all but locked up, and just hope he’s more efficient with on the mound in his second year in the majors. The offense came through again as Nick Markakis was perfect at the plate, going 3-for-3 with an RBI; meanwhile, Randy Winn – who has been struggling – homered and had two hits. Six other Orioles drove in runs. Back on the injury front, the big news from camp the last couple of days has been centered on Justin Duchscherer. It may be safe to assume he may have to be put on the disabled list after experiencing more hip pain. It’s not looking good at all. It was pretty much assumed that there might be issues with the Duchscherer concerning his past history; however, it is still disheartening to see his comeback effort has hit some bumps in the road. I guess now that gives a young arm like Zach Britton a chance to see what he can do in the majors this Spring. Although much of the national media have praised the Orioles for their moves in the offseason, some don’t feel the same way. Two of the more prominent media personalities out there – Ken Rosenthal of Fox Sports and Keith Law of ESPN – differ in their thoughts. I’m sure most fans have read their articles about the Orioles’ off-season and how it bodes for their future. Long story short: Both men generally agree that while the team may win a few more games this season, the long-term development of the organization may have been hampered. They think due to the Orioles trading some of their young players and signing veterans who may make little-to-difference in the standings, they still will not contend in the American League East anyway. It was an ugly day at Ed Smith today as the Orioles got pounded by the Detroit Tigers, 9-1. The pitching got lit up as Brian Matusz gave up three runs – two earned – in 3 1/3 innings. Baltimore’s bullpen wasn’t much better as Mike Ballard and David Riske both gave up three runs each in their outing. Only pitcher Josh Rupe came out unscathed, going 2 2/3 scoreless innings. On the offensive front, J.J. Hardy hit his first homer of the exhibition season and Mark Reynolds went 2-for-3. Miguel Cabrera – whose off the field problems have been prominently noted this month – had three hits with 2 RBIs for Detroit; meanwhile, Casper Wells had four hits, a homer and two runs driven in. Cale Iorg had three hits. There’s been a lot said about Brian Matusz going into this season for the Orioles. As the team is still in a rebuilding stage – despite the addition of talent onto the roster – how they will do next season and beyond will depend on their pitching. The Orioles faced the Houston Astros today on the road and won, 6-4. Well, today’s big story out of the game us centered around the performance of young pitcher Zach Britton. I caught most of the action today on Gameday radio stream on mlb.tv and once again the Orioles played fairly well in their victor, except towards the end of the game. Spring Training can only tell us so much about a player – as they always say – however, if I were a betting man right now, Britton would make the team. Brittton, on top of his excellent performance against the Yankees last week, threw four scoreless innings on Saturday. He would walk and strike out two, while allowing four hits. Since I saw in Clearwater to start off Spring Training, Britton has really impressed me. It remains to be seen if the Orioles want to leave him down in the minors for more seasoning – or let him do his work in the Big Leagues. This afternoon, the Orioles got beat up pretty badly by the Philadelphia Phillies, 13-6. Jeremy Guthrie – who has been pretty good so far during Spring Training – got lit up today as he gave up four runs in four innings. The bullpen also had a rough day as Rick VandenHurk and Kevin Gregg also got knocked around by Philadelphia. Favorites in the National League East this upcoming season, they brought members of their A-lineup – Raul Ibanez, Ryan Howard, Shane Victorino – and they had three homers on the day off Baltimore pitching. However, Clay Rapada – who should make the team – and Jason Berken pitched well and didn’t give up any runs in their innings of work. Randy Winn had an interesting day in the outfield, as he committed two gaffes – perhaps helped out by the windy conditions out – that helped the Phillies tack onto their score. The Orioles did jump on Cliff Lee – who started the game on the mound for the Phillies – as they scored twice in the first inning and added another off an Adam Jones homer in the third inning. Well, the big news out of camp today surrounds Brian Roberts -- again. If history serves me correctly, his back problems flared up last year in Spring Training … and he missed a ton of time that probably directly impacted how the Orioles did in the first four months of the season. 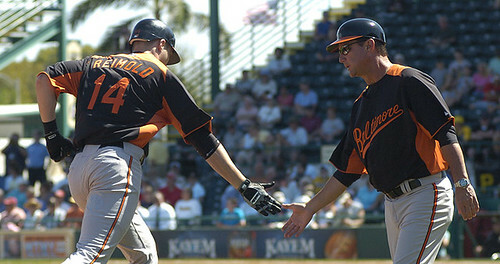 The Orioles won last night against the Pittsburgh Pirates, 11-8, on the road in Grapefruit League action. Brad Bergesen struggled in his latest outing as he only went 2 2/3 innings and gave up four runs – three earned. That’s not good; however, it’s still early. Then again, if Brad is still running into problems during let’s say the last week of Spring Training, it would be time to worry. The bullpen did fairly well; however, in the eight h inning, the Pirates rallied and plated in four runs off reliever Raul Rivero – who was just plain awful. He allowed four runs in just 2/3 of an inning pitched. On the offensive front, Ryan Adams had a homer and drove in four runs, Vladmir Guerrero also homered; in addition, J.J. Hardy and Craig Tatum both had two RBI’s. Today, the Phillies and pitcher Cliff Lee come to Sarasota and face The Orioles. I’m curious to see how it goes. I’m heading home right now after a long vacation filled with a week of baseball and another of fun in the sun. After watching the Orioles person for six games, plus several times over the internet on MLB.tv, they will be a lot better this year than they were previously. Matt Wieters was supposed to be the savior. The one-man wrecking crew that would put the team, and the city, on his shoulders and carry us back to the promised land. He would be the next Cal. He would be our star. He would be the final piece of the puzzle. Going into his third second full season in the bigs however there seem to be more questions than answers. He was called "switch-hitting jesus" by some, other crafted shirts and facts and in the post-modern tornado that is the internet the storm spread and expectations grew. His first major league at bat was the single most jubilant day i have experienced at the ball park. He was met with thunderous cheers that matched the antean task given to him. He was put on the cover of Sports illustrated. Now, Baseball Prospectus one of the very publications responsible for the heaps upon heaps of accolades has now deemed him one of the biggest busts of ALL - TIME. It is good to see that even in negative press Matt Wieters still attract hyperbole. Many Orioles fans have explained Wieters lack of an offensive explosion to his work on being one of the best, if not the best, defensive catchers in the game. And he is. Wieters took to the task of being the field commander every night for the Orioles and that leadership has really started to shine through under Buck Showalter. Wieters looks more muscular this Spring as well. Perhaps THIS is the year that he finally breaks out and as someone once said "unleashes hellfire" on the American League? So far this Spring it hasn't happened. Granted, In six games and 18 ABs Wieters is batting .278, but the only has one extra base hit, no homers and has not shown much power. A criticism that I have heard is Wieters had a "slow bat" last year and this was the primary cause of his offensive struggles. Perhaps, but I honestly don't know how someone without prior training and really good cameras can really make that determination. I mean, I am sure one can see it that some players have a quicker swing vs others but one would think you need more than an HD tv to make that diagnosis. Here are some thoughts from new everyday Oriole shortstop J.J. Hardy about a myriad of topics. Hope you enjoy and a special thanks to Franklin Sports and Kevin McCarthy from Cirillo World PR for providing the blog with the quotes and the Q&A. I don't know if you've heard of this, about Rob McElhenney from “It's Always Sunny in Philadelphia,” have people told you that you look like him? I've heard, yes. Actually, first time I heard it was when Chad Moeller comes up to me and says, “Hey, do you watch this “Always Sunny in Philadelphia?” I go, “No,” and he goes, “Oh, never mind.” And I go, “Why?” and he goes, “Well, there's someone who looks identical to you.” And then I looked it up and then if you look up his name there will be pictures of me next to him. I kind of see it; I feel like my parents and everyone else I've pointed it out, they don't see it. But, I saw it. What is your favorite park to hit in? I think the best success I've had is in Arizona. I don't know if that's because that's where I'm from, but I feel like whenever we go there the hitter's eye is great, the lighting is great and the hot air in Arizona, the ball flies I think. What are some things you like to do when you're not playing ball? I've got a lot of little hobbies. Fishing – now that we're out here in Florida for Spring Training, I fish pretty much every single day when we're done here. In the off-season I spend a lot of time playing Ping Pong, try to keep my game up there. Not as much golf anymore, I used to golf quite a bit. Kind of shot that down, now more Ping Pong and fishing. How did you get to become a Ping Pong player? My dad was a professional tennis player, and he still teaches for a living, and we grew up around it and I have a brother who is about 17 months older than I am, we played Ping Pong growing up and it was a sport that we kind of clicked at, and having someone as good as I was at it, and me as good as he was, kind of kept us getting better. I take a lot of pride in my Ping Pong. Who was your favorite player growing up, and who did you look up to? This is going to seem like it's a coincidence because I'm with the Orioles now but my favorite player was Cal Ripken Jr. I just loved the way he played, I loved the fact that he was out there every single day and the fact that he was a little bit bigger, back in the day that there weren't as many big shortstops, it made me feel like I had a chance to be a shortstop, being a little bit taller. What are your thoughts on joining your new team, the Orioles? So far so good. On the first day of camp, all of the guys seemed great, pretty excited to get out there and start playing some games and I think we're going to surprise some people this year. The big news today out of camp is that there’s no real issue going on with Derrek Lee except for some tendinitis based on the results of an MRI done this afternoon on his wrist. According to reports, he will still sit out a bit, but will try to get ready for Opening Day. Good to hear and we have plenty of time until Opening Day. If he’s not ready, I guess Luke Scott will play first, and you might see Jake Fox play there as well in case of an emergency. The Orioles had another long day of baseball as they had two split squad games – a day and a night one. In the nightcap, the Orioles ‘B’ team lost to the Red Sox on the road, 2-1. With the score tied at one in the bottom of the ninth inning, Baltimore reliever Wynn Pelzer nicked Yamaico Navarro with a pitch … as the bases were loaded. However, watching the game on Mlb.tv, it sounded like the pitch might have hit Navarro’s bat, not the batter. Ryan Drese – who started the game for Baltimore – had some trouble, but did well overall, going three innings and giving up a run. The score for Boston came off a J.D. Drew homer. Drese probably won’t make the team unless someone gets injured, but he’s been serviceable so far and has not embarrassed himself. Then again, he might also have a home in Baltimore’s bullpen as a long reliever, if he can keep it up. Speaking of … the bullpen up to the ninth inning was stellar, as Mark Ballard and Armando Gabino each tossed two scoreless innings. The Oriole offense could not do much against the Red Sox’s Clay Buchholz, who threw four scoreless innings, struck out and gave up four hits. Baltimore’s run came off a Matt Angle RBI in the 8th inning. Veteran Randy Winn struck out three times and probably will be cut sooner rather than later. First base acquisition Derrek Lee will undergo an MRI on his tender wrist tomorrow after seing a specialist today. According to Roch Kubatko over at MASNsports.com, specialist Dr. John Wilckens was confident that there was no new damage to his wrist and that any inflammation was caused by reaction to baseball activities after a long layoff. That seems perfectly reasonable and tomorrow's MRI is just a precaution. In other injury news: Brian Roberts sat out of today's workout with back spasms. Brian and the team are not linking today's aching back with last night's head-first slide into firstbase but it is hard not to make a connection. Some are worried about this, I'm really not. One would has to wonder would Roberts be playing through these types of neck and back issues if it were the regular season and not March 8th. Given Roberts' back issues last year of course people are worried about anything that has to do with the second baseman's spine but until there is actually something other than a sore back to report I think we can all kind of calm down. 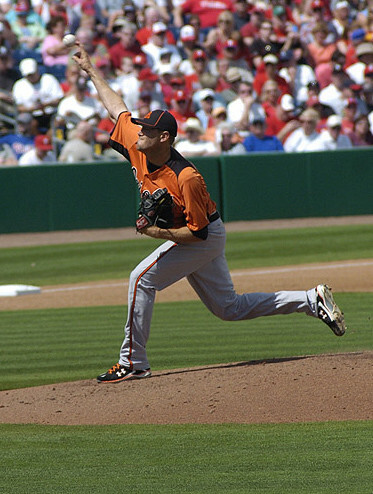 This afternoon, the record will show that the Orioles lost 4-3 in exhibition action against the Philadelphia Phillies ; however, today’s game was important for one main reason: Justin Duchscherer. The right-hander, who has not pitched much the last two years due to a hip injury, plus clinical depression faced a tough Philadelphia lineup and tossed two scoreless innings. Duchscherer was solid , as he gave up one hit and ran into trouble in the second inning; however, he was able to get out of it. The important thing: Duchscherer finished the game pain free. Brian Matusz – in his first start since having a wart removed from his pitching finger – went 2 1/3 innings and struggled a bit. He would give up a homer to Ryan Howard, but overall, it’s good to see him on the mound and suffering no ill effects from his procedure. The bullpen – Chris George, Mike Gonzalez, and Jim Johnson – did their job until the ninth inning where Adrian Rosario struggled and gave up a game-winning two-run to Carlos Rivera in the bottom of the ninth. The Orioles got on the board early jumping on Philadelphia’s Cole Hamels – who went four innings. Baltimore took a 2-0 lead in the first inning off a Jake Fox RBI-double, followed up by a Josh Bell sacrifice-fly. 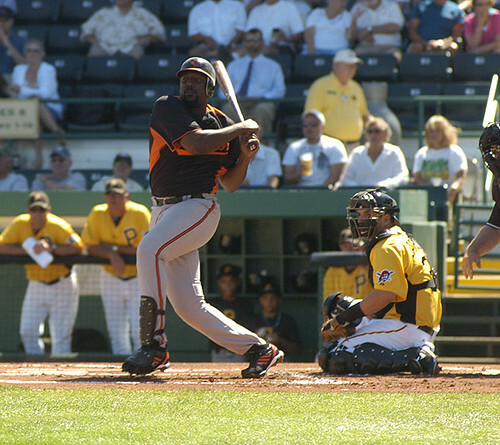 Bell also had another RBI in the sixth inning off closer Brad Lidge. In light of the Orioles’ loss, they have some more pressing issues at hand. As James alluded to in a late post yesterday, they have issues – on the injury front. The Orioles had quite a mixed bag from their young starting pitchers on Monday, as they played two split squad games in one day. Baltimore moved to 4-3-2 in exhibition baseball action as they played to a 0-0 tie to the New York Yankees in the night cap. I saw the game on MLB.tv last night and young Zach Britton looked good despite a few hiccups in his start. He went three innings, gave up two hits, allowed one walk, and struck out one. Considering he faced part of the Yankees A-team lineup – Derek Jeter, Alex Rodriguez, Mark Teixiera and Robinson Cano – Britton’s outing was quite impressive. The bullpen – Kevin, Jeremy Accardo, David Riske and Clay Rapada – did their job and kept the Yankees off the board. Baltimore’s offense was non-existent as they only got six hits; however, the story of the day was Britton’s outing and that should give him a lot of consideration for the 5th starter spot. Then again, he may be slotted for the minors anyway just because of his experience level. In the first split squad game, the Orioles lost to the Boston Red Sox, 6-5. Once again, Chris Tillman had a rough outing on Monday. From what I have seen so far, he needs to show some consistency in his outings and be more efficient, or he’ll be starting the year off in Triple-A. He gave up three runs in the first inning, but says his results didn’t match up his potential. The Red Sox, who had many of their regulars in the lineup made Tillman pay in the opening frame until he calmed down to complete his outing. The bullpen kept the Orioles in the game as Jason Berken, who pitched after Tillman left, went an inning and gave up a run. Nick Bierbrodt, Josh Rupe and Chorye Spoone kept the Red Sox at bay until Mark Worrell allowed Yamaico Navarro to plate in the winning run that broke a 5-5 tie. On the offensive front, Robert Andino drove in two runs and Cesar Izturis added an RBI single; in addition, Nolan Reimold went 2-for-4 with a RBI, plus Matt Angle was 2-for-5. The Orioles have had a pretty solid Spring so far. The team sits a a practice record of 4-3-1 so far. Nolan Reimold is playing strong. So far Reimold is batting .333 with a .722 SLG and an OPS well over 1.0. After working out most of the Winter with former Oriole slugging center fielder Brady Anderson Reimold seems to have found his batting stroke again. Anderson has had nothing but astounding praise for the young player who came crashing down to Earth last year after a promising rookie campaign. Going into this Spring questions about Reimold's ability almost led to him being traded, reportedly, to Tampa Bay for shortstop Jason Bartlett and most likely led the Orioles to picking up DH Valdimir Guerrero. Now Nolan is battling for a roster spot and had a perceived uphill climb due to the age old conditions that are minor league options. Reimold has one, ourfielder Felix Pie does not. Pie's defensive superiority was thought to have given him the leg up but as the Spring has gone on Felix's bat has yet to arrive. In four games thus far Pie has put up a brutal .615 OPS and frankly has just vanished. That is to say, I haven't heard his name mentioned in any light - high or low. Pie has a reputation of sulking a bit when things don't quite go his way. During his benching in the 2009 season it took Luke Scott's tough love to kick him into gear. Pie is probably still the favorite to make the team as of right now in the early going due to his option and the need for a backup outfielder that can play both left field and center field but so long as Nolan keeps his bat alive he may force manager Showalter and GM MacPhail's hand and get his bat in the lineup somehow. 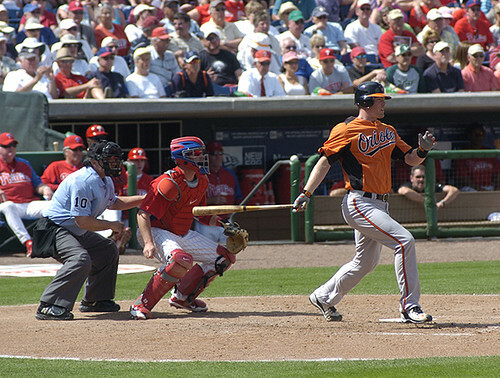 Reimold was a fan favorite almost instantly when he broke on to the team in 2009 and his fall in 2010 was hard to watch on both a blogger and personal level. Keep an eye on him, this could get interesting. Here are some thoughts from Oriole slugger Luke Scott about a myriad of topics -- his workouts, the changes to the roster, new additions, moving to the outfield and more. Hope you enjoy and a special thanks to Franklin Sports and Kevin McCarthy from Cirillo World PR for providing the blog with the quotes and the Q&A. Favorite Stadium to Hit In: My favorite is Arizona. It's great. The ball flies, it's got a fast infield. The best hitters I have ever seen at any level see the ball tremendous there. It's very conducive for hitting. It's a big field, it's large, but the good thing with the ball carrying is that the bloopers fall in and with the fast surface you'll get your ground ball hits. If you do get ahold of it, there won't be a lot of traffic. That light air, the ball cuts right through it and doesn't want to come down. That's my favorite place to hit by far. Toughest Pitcher: There's a few. Just go up and down the American League East. The tough lefties are usually the most difficult. Sabathia and Jon Lester are two that stand out. The guys both have power arms; they run mid-90s plus. They have tremendous breaking stuff. Good sliders, good curveballs. What makes them so difficult is that they are power arms that can finesse you. They can finesse you in a hitters count and drop some breaking balls in. They don't hang too much stuff. They don't give you too much to hit. On His Conditioning Program: I do all the weights and the plyometric training, but I've incorporated cutting wood with an axe. I left completely behind me hitting off a tee and taking batting practice during the offseason. The reason why is I come to Spring Training and I have to fix everything, so I don't pick up a bat until a week before Spring Training. I like to get out in the cold weather when I train out in Oklahoma. I cut the tree down, then once it's down on the ground I piece up the whole thing with an axe. Trunk, branches, everything. The end result is it builds tremendous forearm and grip strength. It also teaches the basic swing, you can't do anything wrong. If your hands cast out or you do something that wouldn't be good as far as mechanics go with your swing, the axe will usually bounce off the tree and it'll laugh at you. But if everything is right, sound and your mechanics are good, when you hit the tree the right way it'll cut through it right away like nothing. It's worked for me. Today, the Orioles lost to the Minnesota Twins, 3-0, in exhibition action down in Fort Myers, Florida. Jeremy Guthrie put in a good effort, going three inning and allowing two runs; meanwhile, reliever Rick VandenHurk struggled in his three inning outing, allowing two hits, walking four and giving up a run. There was not much on the offensive front for the Orioles, as they only mustered four hits – all singles. I’ve now left Florida and I’m on the second leg of my vacation before I return back north on Friday. I’ll say in my time in Sarasota, pretty much all the fans who rooted for the Orioles – plus who don’t – truly feel that the team has improved. Obviously, much of the strong feelings towards Baltimore’s improvement is due to the many additions to the roster, influence of Buck Showalter and the strong showing in the last eight weeks of the season. This afternoon at Ed Smith Stadium, the Orioles and Boston Red Sox played to a 4-4 tie as the game was called after ten innings. Jake Fox tied the game in the ninth to send Saturday’s contest into extra frames. Right now, he is having quite a strong showing in Spring Training – at least from what I have seen – and is trying to force his way onto the roster coming up north. Brad Bergesen -- who started the game for Baltimore, against Boston’s B-League team (ok, split squad) with Jacoby Ellisbury and Carl Crawford in the lineup – struggled on the afternoon. He gave up three runs in three innings of work and was hit pretty hard. 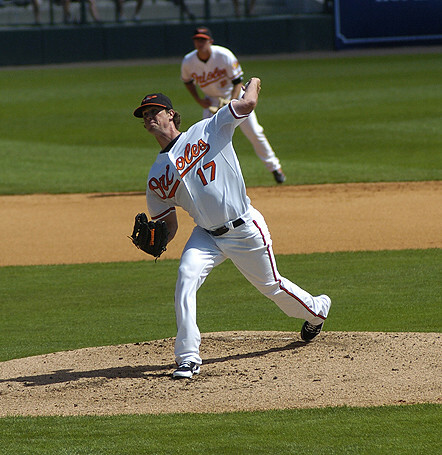 Again, for the Orioles to be successful in 2011, the pitching must come through. It’s early in Spring Training, but like I said yesterday, the arms have to be consistent start after start for the Orioles to even make headway in the American League East. Vladmir Guerrero had a two-run single with the bases loaded in the fifth inning to tie the game at three, and prospect Joe Mahoney had an impressive showing going 3-for-3 with a walk, plus a stolen base. After Bergesen’s poor showing, the bullpen – Mark Hendrickson, Jim Johnson, Mike Gonzalez and Raul Rivero – hunkered down and kept Boston off the board until the ninth inning. Pedro Viola gave up the fourth run for Baltimore as Boston’s Oscar Tejada – who went 3-for-5 with 3 RBIs – singled to break a 3-3 tie. I didn’t watch the Orioles today in person, but they did win today with a 6-2 win over the Detroit Tigers to up their record to 4-1 for the 2010 Grapefruit League season. Jake Arrieta got the start and was so-so in his outing, giving a run on two hits, plus a walk in six innings. Hopefully, he’ll use this Spring Training – much like Chris Tillman – to be more consistent and economical with their pitches. Right now, that more than anything puts pitchers in a hole early and just leads to a bullpen being taxed. That trend needs to stop if the Oriole arms are going to be successful. As I said, the new offensive additions are nice; however, how the Orioles do this season will depend greatly on the starting pitching – especially out of the young arms in the rotation. If these guys can’t go at least six innings, or worse throw 80, 90, 100 pitches even before the fifth inning – over even sooner – they will put the Orioles in a hole. It won’t matter if the Orioles score four or more runs a game, the losing seasons will continue unless the mound performances by the young pitchers improve. I think one of the big stories out of camp right now happens to be Nolan Reimold. As we all know, Spring Training is not a very good indicator as to how some players turn out during the regular season; however, Reimold is doing his best to leave a mark. Major League Baseball Players Association Executive Director Michael Weiner spoke for a number of minutes with the Baltimore media this morning. He was in Sarasota today as part of his tour of all 30 MLB Spring Training camps. He had a lot to say about the latest business of the sport, happenings in the NFL and more. The recording started about less than a minute into the conversation. The Orioles this afternoon were handed their first loss in Grapefruit League action as they were beat by the Minnesota Twins, 2-0. Lefty Brian Matusz was solid on the afternoon as he went two innings, struck out two and didn’t allow a hit to the Twins. After the game, it was revealed that Matusz will need a wart removed from his middle finger on his left hand and may miss his next scheduled Grapefruit League start. The bullpen held its own until the eighth inning when Chroye Spoone coughed up two runs to Minnesota in the frame and decided the game right then and there. They got scoreless innings from Kevin Gregg, Jeremy Accardo, Adrian Rosario, Josh Rupe, Wynn Pelzer and Clay Rapada. Here are more photos from the revamped Ed Smith Stadium. Today, the Orioles opened up their Grapefruit League home opener and I'm sure you've read in other place -- their Florida home is nothing short of amazing and absolutely beautiful. Before the game, I took a stroll around the stadium's interior and snapped away with my camera along with my smartphone. I was speaking with a fan today and he said right before the game that the Orioles will lead the league in homers. I kind of snickered at his sentiment, but the more I thought about it – he may be right. They showed that today as they beat the Rays, 12-6. Nick Markakis had two homers on the day with 4-RBI and was perfect at the plate, going 3-for-3. The Orioles slugged five homers – all in the first two innings – off Tampa Bay starter Andy Sonnastine, who must have gotten whiplash seeing the balls fly out of the park. Vladmir Guerrero, Adam Jones and Jake Fox all also homered in the huge that gave the Orioles a 2-0 record in exhibition action. The first two frames for Baltimore were something out of a video game and very thrilling to see. It’s too bad that the Orioles were playing in a glorified practice game today. If I what saw out of the Baltimore lineup – even without Derrek Lee – this afternoon resembles anything we may see in the near future, baseball will be exciting again at Camden Yards sooner rather than later. Again, I’ll say this: Based on what I have seen out of Vladmir Guerrero so far (in two games worth) he’ll potentially be a boon for Baltimore. I can see it. Brian Roberts went 2-for-3 and Brandon Snyder plated in two runs later in the game. Jeremy Guthrie was excellent, as he went two innings, gave up no hits and struck out one. Seeing him on the mound was very encouraging to see, despite his relatively short performance on the afternoon. The bullpen struggled a bit as Rick VandenHurk gave up a run in an inning of work; Mark Hendrickson gave up a run in his outing as well, and David Riske gave up two runs – on two homers – in 2/3 innings worked. Jason Berken also struggled as he gave up two runs. The Orioles upped their record to 3-0 in Grapefruit League action as they beat the Philadelphia Phillies, 3-0, this afternoon in Clearwater, Florida. Baltimore got much of their offense from Matt Wieters who had a big day going 3-for-4 with 2 RBI’s. Brendan Harris, Felix Pie and Matt Angle each drove in a run as well. Meanwhile, Chris Tillman – who is definitely a candidate to start the season off in Triple-A – got through his two inning outing, but gave up a run and was plagued with control issues on the mound. It was a beautiful day in Florida and this afternoon I caught the Orioles (on the road) against the Pirates in Bradenton, Florida. It's wonderful to see live baseball again and despite watching exhibition games this week, it's good to be out of the Mid-Atlantic and not having to endure some terrible weather at the moment. Here are some brief impressions that I got from Monday afternoon. It will take me a while to get used to seeing Vladmir Guerrero wearing an Orioles uniform. Despite Guerrero’s age and some fans not liking the fact the team signed him, he can hit the ball very, very hard. I think he'll be fine for the Orioles as-is. The slugger looked good in the time I saw him during BP before the game and hit well against the Pirates. And yes, he is a big, big man. Spring Training is supposed to be a very relaxed atmosphere; however, Buck Showalter is all business -- all the time. Watching his demeanor throughout the afternoon, the man is completely focused on the job and isn't one to really mingle at all. I noticed that fact even moreso today. Also, Ryan Drese -- who pitched two innings and didn't even know was still in the majors -- looked very good. 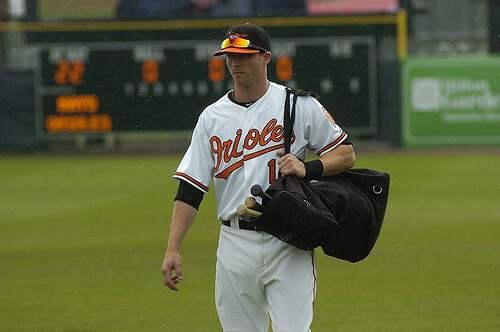 Nolan Reimold. Real good to see him back in the fold with the Orioles. He had a solid day at the plate (including a homer) and seemed to be over his injuries, plus played the entire game. There’s only so much you can tell from one contest, but Nolan seems to move a lot better in the outfield and his workouts with Brady Anderson in the off-season has obviously paid off. Brad Bergesen looked very good in his two innings off work – striking out two, while issuing a walk. The duo of Jeremy Accardo and Kevin Gregg looked good in their outings; meanwhile, Koji Uehara got hit around pretty good (he would yield a run) and Clay Rapada in his inning of work gave up a home run to Lyle Overbay.